Mystic seaport is the United States' leading maritime museum consisting of a village, ships and 17 acres of exhibits depicting coastal life in New England in the 19th century. 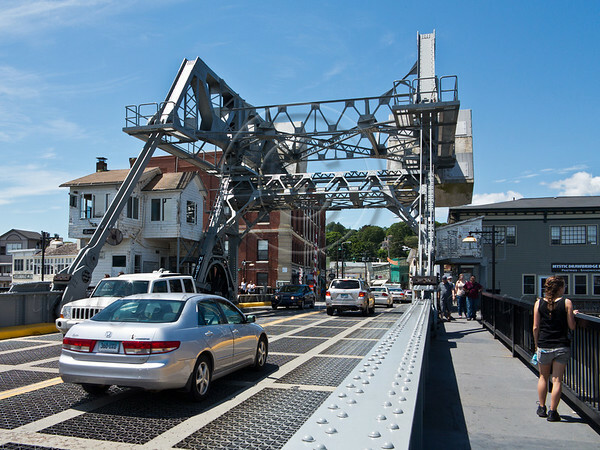 The Mystic River Bascule Bridge is a drawbridge with counterweights designed by Thomas Ellis Brown of New York and built in 1922. it opens approximately 2,200 times per year, with each opening lasting approximately 5 minutes. Mystic, Connecticut, USA. 21-July-2012. Mystic seaport is the nation's leading maritime museum consisting of a village, ships and 17 acres of exhibits depicting coastal life in New England in the 19th century.